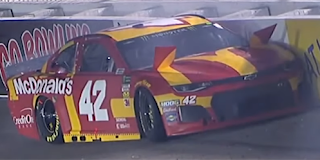 Kyle Larson picked up the 6th last-place finish of his Monster Energy NASCAR Cup Series career in Saturday’s Toyota Owners 400 at the Richmond Raceway when his #42 McDonald’s Chevrolet was involved in a single-car accident after 125 of 400 laps. The finish, which happened in Larson’s 192nd series start, was his second of the season, his first since Texas, two races ago. 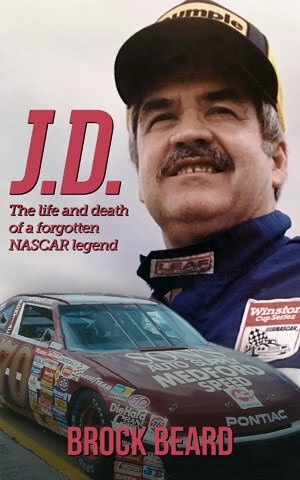 In the Cup Series last-place rankings, it was the 24th for car #42, the 579th from a crash, and the 760th for Chevrolet. Across NASCAR’s top three series, it was the 35th for the #42, the 1,176th from a crash, and the 1,653rd for Chevrolet. Larson came to Richmond in need of a turnaround. His last-place run in Texas dropped him from 11th to 12th in the series standings, and marked his third consecutive finish outside the Top 10. Things went no better at Bristol, where a year after nearly winning the Food City 500 in a late-race shoving match with Kyle Busch, finished a disappointing 19th after a late spin. Now 14th in the standings, Larson was still one to watch on the 0.75-mile short track. 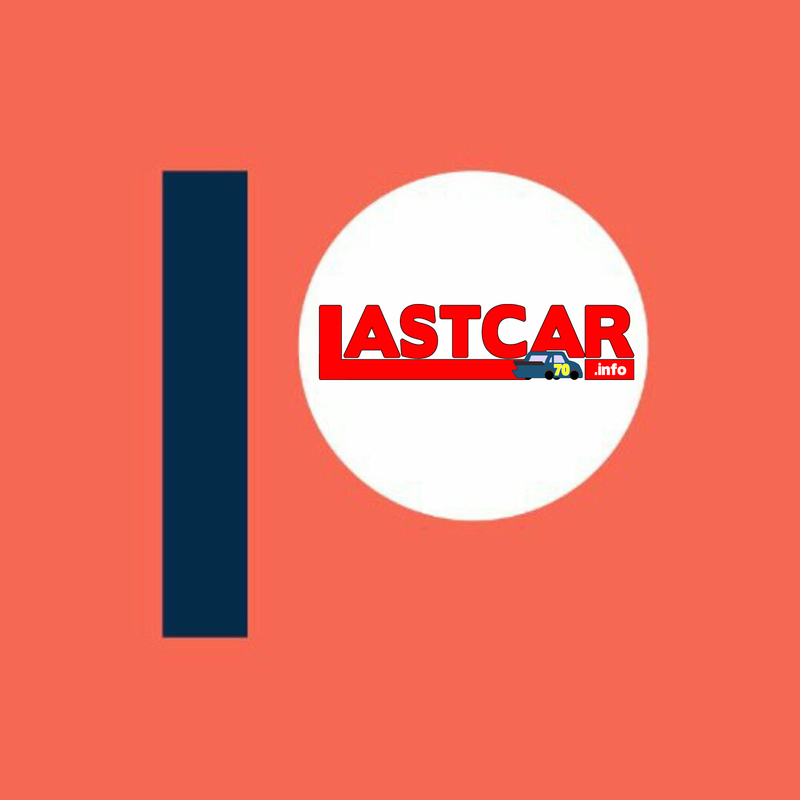 In ten previous Richmond starts, Larson had finished no worse than 16th, winning in the fall of 2017 and finishing 7th in both races last year. Driving the same McDonald’s paint scheme with which he nearly won the second race of the season in Atlanta, Larson was fastest in Friday’s opening practice session, ran 2nd to teammate Kurt Busch in Round 1 of qualifying, then took 14th in Round 2. He then advanced four more positions on Saturday after four drivers ahead of Larson failed pre-race inspection: outside-polesitter Erik Jones (#20 DeWalt Toyota), 7th-place Chase Elliott (#9 NAPA Auto Parts Chevrolet), 9th-place Daniel Suarez (#41 Haas Automation Ford), and 10th-place Jimmie Johnson (#48 Ally Chevrolet). The inspection failures caused last place to change hands before the race even started. As of Friday, the spot originally belonged to Ross Chastain, whose #15 Rim Ryderz Chevrolet was the only car to not take time in Round 1. That changed when Jones, Elliott, Suarez, and Johnson ended up slotted in behind him on the starting grid. Four other drivers also failed the same pre-race inspection, meaning nine drivers would have no listed qualifying speed: 15th-place Aric Almirola (#10 Smithfield “Get Grilling” Ford), 18th-place Denny Hamlin (#11 FedEx Ground Toyota), 20th-place Matt Tifft (#36 The Pete Store Ford), and 36th-place Joey Gase (#66 Eternal Fan / Sam Bass Tribute Toyota). The result of all this moved Chastain up from last to 29th with Hamlin, highest of the disallowed drivers in Owner Points, taking 30th. Taking the 37th and final spot was Gase, whose Motorsports Business Management entry was covered completely in the artwork of the late motorsports artist Sam Bass. On the starting grid Saturday, Gase’s team elected to install two different radios in the #66. After the command, the car then stopped briefly at the end of pit road and was nearly passed by the leaders before he caught up to the tail end of the second pack. Team owner Carl Long joked with Gase during the brief four-wide salute the field gave the crowd, waiting for someone to say “green, green, green” on the radio. When the field sorted itself out for a start, Chastain fell back to the rear, regaining his 37th starting spot from Gase. Joining him in his trip to the rear was 28th-place starter Quin Houff, back in Spire Motorsports’ #77 Falci Adaptive Motorsports Chevrolet. Houff lined up to Gase’s outside with Chastain rolling behind the pair, and the group stayed in that formation as the green flag waved. On the break, Chastain was already advancing on Houff, who had fallen behind Gase into 36th. Houff was thus 37th as the field crossed the starting line for the first time, and would hold the spot for the first quarter of the race. Despite several issues with speed in recent weeks, Gase’s #66 managed to pull away from Houff, building a full straightaway’s advantage over the #77. On Lap 14, race leader Kevin Harvick was within sight of Houff, and heading into Turn 3 on the 15th circuit, he pulled to his outside and put Houff the first car one lap down. 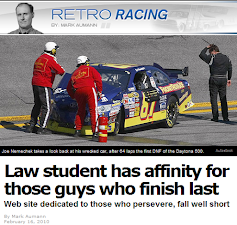 Houff lost a second lap on the 34th circuit, and on the Lap 40 competition caution reported his car was an “8” on a scale of 1-10 in terms of tightness. Houff took the restart with a new spring rubber in the right-rear, but soon reported his car was chattering. 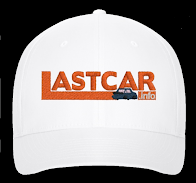 He lost a third lap by the 65th circuit, a fourth on Lap 89, and at the end of Stage 1 on Lap 100 reported his front tires were completely worn out. Gase didn’t get away from Houff as easily on the Lap 111 restart as cars began racing side-by-side in front of the #66. Three laps later, the spotter reported smoke from a car further up and a possible caution. The source turned out to be Kyle Larson. Shortly after the restart for Stage 2, Larson was in the middle of a tight battle for position. Heading into Turn 3, he made contact with Daniel Hemric, whose #8 Baas Pro Shops / Tracker Boats Chevrolet was trying to make a move to his inside. The contact caused a serious fender rub on Larson’s left-rear, and the #42 fought to keep control in the high lane. Still under green and with a constant stream of traffic to his inside, Larson struggled to make it to pit road, returning to the track laps down in 31st. The issue seemed resolved until Lap 127, when another tire blew on the Larson machine, sending him spinning into the outside wall. The car slammed the fence with the driver’s side, causing heavy damage to the left-rear and left-front. Larson managed to drive his car to pit road under caution. While the crew instructed him to pull into his pit stall, the driver said “going to the trailer – it’s destroyed” and made a left-hand turn directly into the garage area. Just like Aric Almirola last week at Bristol, the decision eliminated Larson from the race under the “Crash Clock” damaged vehicle policy. 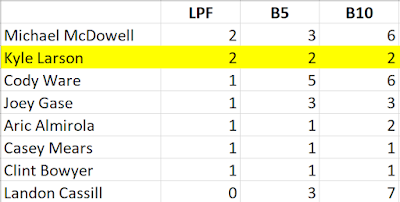 Larson took last from Houff on Lap 132, and was unavailable on RaceView by Lap 134. Curiously, with the finish, Larson now has more Cup Series last-place finishes (6) than wins (5). 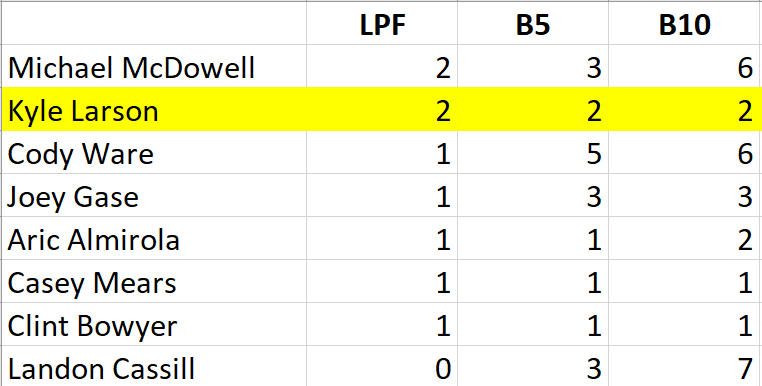 The only other DNF fell to Michael McDowell, who suffered a hard Turn 1 crash of his own on Lap 243. McDowell cut down a tire and slammed the wall with the driver’s side of his #34 Dockside Logistics Ford, and was reportedly frustrated with track safety crews for not giving him enough room to drive back to pit road. Out of the car, McDowell was effectively out of the race. The only other driver to spend an extended period of time in the garage on Saturday was Landon Cassill, whose #00 Superior Essex Chevrolet pulled behind the wall during Stage 2 and spent more than 70 laps. The team’s Twitter reported a fuel pressure issue, and the crew managed to get the #00 back on the track for the finish, leaving them the final car running. Rounding out the Bottom Five were Houff and Gase, each one lap apart from the other from the race’s early stages. Houff earned his first Bottom Five of 2019. *This marked just the second time car #42 finished last in a Cup Series race at Richmond. The only other time occurred on September 10, 1994, when Kyle Petty’s Mello Yello Pontiac broke the oil pump after 22 laps of the Miller Genuine Draft 400. It was Petty’s only last-place finish in the Mello Yello colors, and came in his fourth and final season with the brand. Right you are - correction made.